A minister in Charlotte, North Carolina, David Jordan has studied, led groups, taught, and preached in more than thirty countries. David and his wife, Beth, live in Huntersville, North Carolina, with their three children. They enjoy music, sports, hiking, travel, and gardening. “The journey through Subversive Words makes my heart sing! David Jordan has a gift for words and playfulness in biblical interpretation that I envy and you will enjoy-and a gift for asking what these passages mean for living our lives with integrity and a little humor. I especially love his way of opening Luke’s Gospel, and Acts, to us. The Bible is a place where babes can wade and find meaning, and scholars can swim and never touch bottom. What is it all about? What are we supposed to do? Why are we here? Who’s in charge? And what about those days when nothing seems to be going right, when life has gotten off track and better days seem exasperatingly out of reach? The Bible, with all of its various voices and styles of procla&SHY;mation, is particularly aware of the sad conditions that stifle the human spirit. It also, consistently and creatively, addresses these inevitable questions that emerge. One of the many reasons we can speak of the Bible as God’s Eternal Word is that it speaks to and about people just like you and me. Illustrated through&SHY;out its pages are flawed characters that look, sound, and act an awful lot like all of us. So, throughout the ages, we call the Bible inspired and inspirational, in part due to the ongoing relevance of its message. In spite of the passage of time, these scriptures remain amazingly in touch with what every one of us throughout the generations thinks and feels. Depending on the literary style of a particular scripture, there can be anything from challenge to comfort, humor to condemnation, wisdom to warning, or remembrances punctuated with necessary boundaries. Feeling lonely, abandoned, or left out? Read Psalm 139, or Isaiah 40, or virtually anything in Hebrews or Philippians. Do you wonder about the nature of humanity and how we get ourselves into some of the fixes we do? Genesis 4 guides us on a journey of warning as well as discovery. Is it difficult to understand why we are too often fearful or unwilling to take responsibility? Genesis 3 leads us through a playful menagerie of striking insights into our human condition. Long ago, people pondered the same questions we do today: why are there multiple languages and different colors of skin, or why do women experience pain in childbirth, or why do snakes slither? Science was not the issue; the teaching was less concerned with factual information than with the interpretation of what people saw and experienced. And there were questions of origins: Who is in charge of all this stuff? Where did it come from? What is the creator of all that surrounds us like? And what is it that the creator expects of the creation? So it is to questions like these, and to the conditions of people’s everyday realities, that the Bible speaks. The journey unfolds initially as cosmic poetry, then quickly comes creation as seen through the lives, dilemmas, defeats, and victories of biblical characters that serve as our biblical stand-ins.1 We are to take what we observe seriously, and experience these events, adventures, and perspectives with the same playful spirit with which they were first expressed. Take for instance the talking snake in Genesis 3 or Jacob’s strange and mistaken night with the wrong woman in Genesis 29, and you can imagine the first speakers of these stories enjoying the knowing smiles of their audience. Creatively keeping attention, they made points that demonstrate remarkable insight into our humanness and our consistent tendency to lean in the direction of wrong choices, sinful ambitions, foolish living, and occasional clever comebacks that hurt feelings and generate animosity. One criticism of biblical material over the years has been its apparent lack of humor. But these critics read with limited vision. Jesus was a master storyteller in the multiple ways he utilized shock, insight, everyday imagery, and humor to create a listening environment most conducive to a change in perspective. This was a long-standing and central part of ancient story-telling tradition in a culture where the vast majority of listeners couldn’t read or write. Recall Jesus evoking the mental picture of a religious bigot straining out tiny specks of dust from his tea while a camel with big feet and a giant hump (or two) stands placidly in the middle of his cup. The sight, smell, and waste products created by this comical image both teaches against hypocrisy as well as facilitates a knowing, confessional, and personal connection in each of us. There is the paradoxical image in Luke 12 of a rich fool so taken with his surplus of crops that he can think of nothing else to do than to build more barns. With his poverty-stricken vision of community, he has only his soul (pshyche) with which to converse. His conversation echoes the model story that Jesus utilized from Ecclesiastes 2 with the later phrase from that existential Hebrew work: “Let us relax, eat, drink, and be merry.”2 While comic and tragic at the same time, the picture painted relates a humorous take on the serious problems facing human nature. Jesus captures perfectly our eternal tendency to self-absorption with the use of this clueless rich guy. And what of Abraham and Sarah? Beginning with Genesis 11, scripture moves from the cosmic and universal to the particular and personal. From questions and answers that connect us to humans everywhere, the Bible hones in on one guy, well up in years, and his barren, bitter, and elderly wife. This “wandering Aramean” was a classic nobody of the urbane Sumerian cultural context. From this sophisticated cityscape-one of writing, well-planned agriculture, wide-spread irrigation, and learned science and mathematics3-lopes this unconnected country boy on the back end of life. Yet, it is Abraham and Sarah who will serve as the foundation for a new people and as the vehicles for God’s dynamic intervention in history. From this calling might come our modern expression: “Are you kidding me?” Elie Wiesel, Nobel Peace laureate and Auschwitz survivor, describes his reaction when reading Genesis as a little boy and coming to Sarah’s old age discovery. He runs excitedly to his mother and yells with delight: “Momma, Sarah is pregnant!”4 And with Wiesel, our minds conjure the dramatic juxtaposition of a ninety-year-old woman wrinkled and pregnant with Pampers and Depends in the same shopping cart. And so it is: the incredu&SHY;lous hearing and reading of God’s dramatic, inconceivable, miraculous, tenuous, tragic, and often humorous intervention in our human condition is for you and me-if only we take the time. Read Genesis 29 again, imagining Jacob spending an entire wedding night without ever speaking to, seeing, or hearing the woman with whom he was supposed to be consummating his marriage. No loving caresses or pillow talk? No “let’s get to know each other a little better?” No candles burning or lamps lit to enjoy a romantic atmosphere? Leah was described as having “lovely eyes,” a Hebrew euphemism for our equivalent of a “good personality.” The whole scene, both before and after the wedding night, evokes a kind of slapstick comedy of tongue-in-cheek humor. But, unlike the hearers of the story, the tellers know keenly that it is the unlovely and unwanted Leah who will represent the lineage of God’s covenant. And it is this lineage that ultimately becomes the story of Jesus. It is the homely Leah-not the beautiful Rachel-who will be the matron of God’s salvation history. 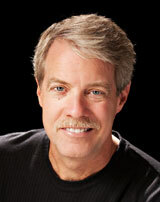 So, humorous wisdom weaves its way through&SHY;out the Bible. In most cases-as with Abraham, Sarah, and Leah-it is a humorous wisdom with a transfor&SHY;mative edge that unveils a hidden but awestruck awareness of God’s nature: to use the weak of the world to shame the wise, to use the unwanted of society to usher forth the blessings of God, and to use even the unwilling in places of power to proclaim the good news of God unto the ends of earth. This is where the title of this book comes in: Subversive Words. To subvert something is to challenge or to undermine it. Our task throughout these pages will be to recognize the consistently subversive nature of scripture. The Bible seems to have a non-discriminatory policy when it comes to religious “good” people or non-religious “bad” people. We are all in the line of biblical critique. This is particularly true if we have stumbled into the “conventional wisdom” of our era. CONVENTIONAL WISDOM: Ideas generally accepted as true by the public or by experts in a particular field. An example of Conventional Wisdom: The religious authorities of Late Antiquity and Renaissance held firmly to the idea that the earth was the center of the universe. It remained conventional wisdom that God’s highest order of creation, namely us, would be strategically placed at the middle of God’s concern, both spiritually and physically. The beginning of the Enlightenment brought new insights refuting that assumption. Only after several decades of countless arrests, prosecutions, and forced recantations did the previous conventional wisdom give way to new evidence and understandings. Until then, the conventional wisdom of that day was adamantly preached, authoritatively taught-and abundantly wrong! Jesus spoke subversive words to the conventional wisdom of his time, just as the prophets did to theirs and Moses did to his. This was how the Bible came to be. And together, these collected sayings, parables, stories, insights, and critiques still call out to us in our day. So, let us do what the Bible intends: hear, learn, be challenged, and enjoy swimming more deeply in the biblical wisdom that speaks to our conventional wisdom with subversive words that wield a transformative edge. And, like those scholars from the saying my grandmother shared with me, we can swim in the depths of these biblical waters for the rest of our lives and never touch bottom. And our lives will be enriched as never before. In the beginning when God created the heavens and the earth, the earth was without form, and darkness was over the face of the deep. Then the spirit (the wind, the breath) of God blew over the face of the waters, and God said: “Let there be light!” And there was light(Genesis 1:1). Fear does funny things to people. I had a strange room as a kid. In the daylight, it was perfectly normal, like any other kid’s room, I suppose. But at night, strange things happened. It felt like a formless void, and darkness was over the face of the deep. Shadows moved and swayed; small sounds in hidden corners sent foreboding messages that all was not well. The closet looked suspiciously dark; the room felt strangely foreign; an animated tree outside scratched with gnarled fingers against a thin window. And what about that small space under the bed? Could it be that something was under there? All was suspect: cold air became the breath of monsters and a streetlight the searching beam of a UFO. Even a barking dog could be the wolf of a wandering witch looking for sweet, innocent children like me to scoop up into her wicked lair in the North Woods. Outnumbered, I was a lost cause, vulnerable to the forces of evil lurking-my room was a vortex of nefarious forces … and darkness. Being a kid and fighting nightly battles with evil forces is an exhausting enterprise. And few of us are spared the incon&SHY;venient terrors that punctuate those evenings of childhood. Consequently, the opening poetry of Genesis acquaints us quickly with unfamiliar images of a spinning, formless universe bathed in a palpable absence of light. And too many of us spend a good deal of our waking hours afraid, not so much of the literal dark, but of what spins around us and lurks behind us: financial difficulties, job uncertainties, aging, physical pain, or concerns for our family and children. To sleep-perchance to dream. Ah, there’s the rub! Then the spirit (the wind, the breath) of God blew over the face of the waters, and God said: “Let there be light; and there was light” (Genesis 1:1).? If you’d like to read the rest of this story and more, order Subversive Words by David M. Jordan today. 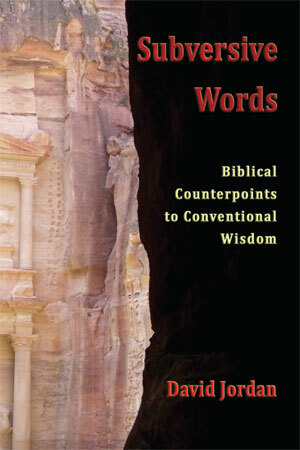 Be the first to review “Subversive Words (Biblical Counterpoints to Conventional Wisdom)” Click here to cancel reply.